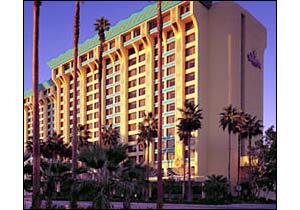 Disney's Paradise Pier Hotel is a one-star deluxe hotel at Disneyland. Formerly the Disneyland Pacific Hotel, this is the least-celebrated (and least-crowded) official Disney hotel, but many rooms offer excellent views of Disney California Adventure. The interior is reminiscent to a remodeled motel. Although very clean, the furnishings are old and outdated compared to its price point.